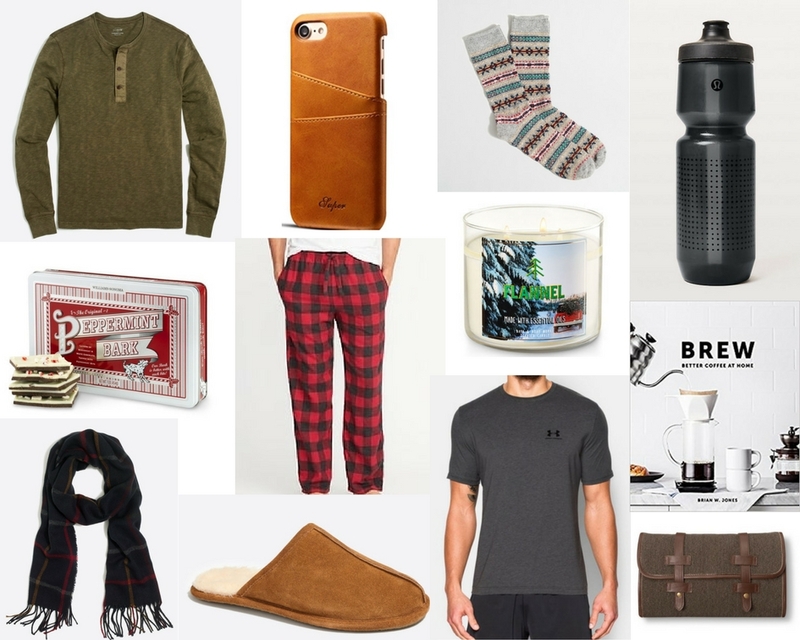 Gifts Under $25 for Him. 1.) J Crew Henley Shirt: for the preppy guy. 2.) Leather IPhone Case: for the tech guy. 3.) Festive Socks: for the guy who has everything. 4.) Lululemon Water Bottle: for the gym guy. 5.) Peppermint Bark: for the sweet guy. 6.) Pajama Pants: for the cozy guy. 7.) Bath & Body Works Candle: for the guy who says he doesn't need anything. 8.) Coffee Book: for the barista guy. 9.) Man Scarf: for the fashion forward guy. 10.) Slippers: also for the guy who says he doesn't need anything. 11.) Under Armour Tee: for the active guy. 12.) Toiletry Bag: for the traveling guy.